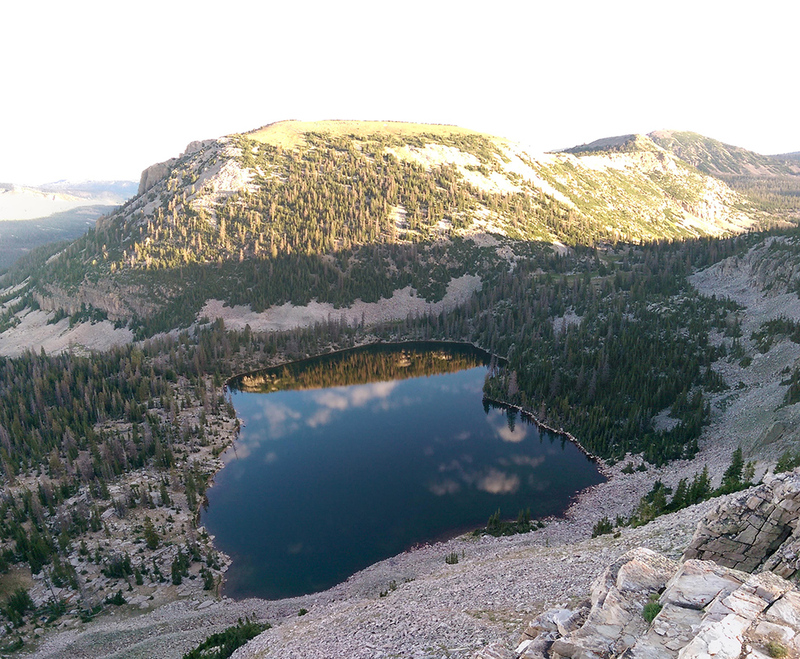 The Lofty Lake Loop trail is a great one to do from Steiner during your week at scout camp. The actual loop trail is only 4 miles, but that extra mile needed to make it a 5-miler is easily accomplished. The two times I’ve done this hike, once with my co-leaders in 2014 and again as a troop last month, we went in a clockwise direction. Starting from the main flag area across from the Dining Hall, we went around the west shore of Scout Lake on the Mafeking trail. After the trail hooks around to the north side of the lake, you quickly find the intersection with the Lofty Lake Trail. At that point, head southwest toward the ice caves. You will drop about 250′ in elevation along this stretch to the Pass Lake trailhead, which is only a mile from where you started at the flag poles. 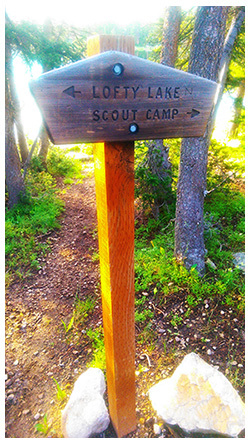 The Pass Lake trailhead is one of the places you could begin your hike if scout camp was in session but you weren’t staying at Steiner. From this point, you descend about 200′ more to the valley floor and Reid’s Meadow before you begin the uphill climb to Kamas and Lofty lakes. Kamas Lake is 1.5 miles from the Pass Lake TH at 10,500 feet while Lofty is another mile further and 300′ higher. On the way to Lofty are great views to the north of Cutthroat Lake and the Hayden Fork drainage. Once you reach Lofty Lake, you will be less than a quarter mile from the highest point on this loop and what we call “the saddle“. Here you can take in a view of Camp Steiner below. From that point, it’s all downhill back to camp to complete your 5-miler. My troop of 12 and 13 year-olds completed this loop in 2.5 hours. We were in no rush and took this hike at a pace everyone was comfortable with. No one complained and in fact, it sparked the idea of going after the Hiking merit badge which they got excited about! Start at the Pass Lake trailhead and pop into camp to have a look around – you might consider Steiner for your next week-long scout camp. At “the saddle”, take a quick side-trip to Paul’s Point for your extra mile (1/2 mile in, 1/2 mile back). While you’re up there, wander a bit over to peak 11,113 for a birds-eye view of Kamas Lake… notice where you just came from below! Park at the locked gated entrance to Steiner and hike up the Traditional trail into camp (1/2 mile), then follow the gravel road to the main flag area. 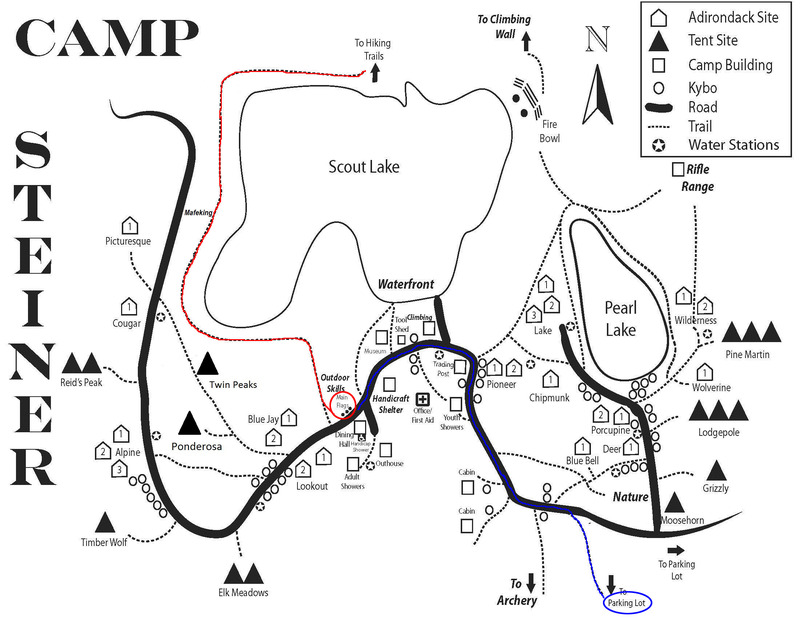 Reserve an Adirondack* for a fall campout during Steiner’s off-season with the intent to complete this 5 mile hike as part of your overnight scout outing. * The Great Salt Lake Council makes these 3-sided cabins available to scout groups after summer camps are over. The rental cost is $25/night as of this writing. We’ve done that twice before too – both times in September with the whole place to ourselves. 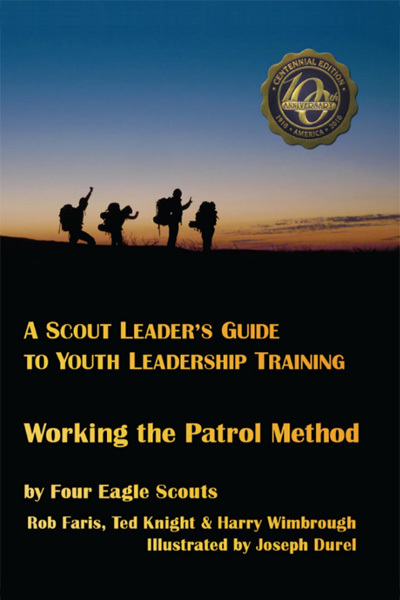 This entry was posted in Hiking and tagged 5 miler, boy scouts, bsa, camp steiner, hiking, lofty lake loop trail, merit badge, pass lake trailhead, scout hikes. Bookmark the permalink.